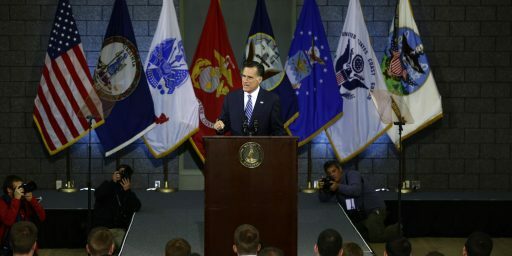 Mitt Romney believes he could take America to war without Congressional involvement. Last year, many conservatives criticized President Obama for authorizing American participation in the UN/NATO operation in Libya without first having sought Congressional approval for the operation. At the time, I joined in that criticism because it seemed pretty obvious to me that the President had unilaterally determined that United Nations Security Council Resolutions were sufficient authority for him to participate in a war against a sovereign nation that had not threatened the vital national interests of the United States. Of course, it was rather obvious that much of the criticism of Obama’s actions was based in pure partisan politics, particularly among people like Newt Gingrich who brazenly criticized the President for doing exactly what he had been calling on him to do just a few weeks beforehand. Notwithstanding the politics, it was good to see at least some Members of Congress attempting to reassert that body’s Constitutional prerogatives in this area. SCHIEFFER: Let me turn to foreign policy. Bill Kristol, writing in the Weekly Standard this week, says we are reaching the time of consequence in our dealing with Iran on nuclear weapons. He says it is time for the President to go to the Congress and say, “I want you to authorize me to be able to use military force” if that becomes necessary. And he says if the President is not willing to do that, then the Congress should do it themselves. What’s your take on that? 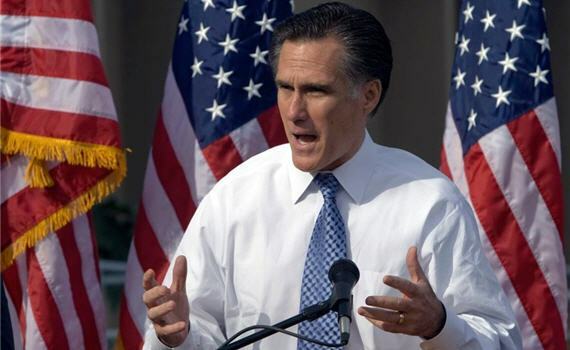 ROMNEY: Well, I can understand the reason for his recommendation and his concern. I think he’s recognized that this president has communicated that in some respects, well, he might even be more worried about Israel taking direct military action than he is about Iran becoming nuclear. That’s the opinion of some who watch this. And so he wants the President to take action that shows that a military Iran, that a nuclear Iran is unacceptable. And I believe it’s important for us to communicate that. I can assure you if I’m president, the Iranians will have no question but that I will be willing to take military action if necessary to prevent them from becoming a nuclear threat to the world. I don’t believe at this stage, therefore, if I’m president that we need to have a war powers approval or special authorization for military force. The President has that capacity now. I understand that some in the Senate for instance have written letters to the President indicating you should know that a containment strategy is unacceptable. We cannot survive a course of action would include a nuclear Iran we must be willing to take any and all actions. All those actions must be on the table. If anything this an even more brazen thumb in the eye of Separation of Powers and Congressional War Powers than Obama’s decision to intervene in Libya, which was limited mostly to Americans acting in a support role while the British and French conducted most of the combat operations. What Romney is saying is that he, as President, to decide on his own to commit and act of war on behalf of the United States that nearly every analyst who has looked at the issue concludes poses an extremely high risk of exploding into a wider regional war and/or inspiring acts of terrorism against the United States, Israel, and American interests abroad. Economically, the consequences of such a decision could be catastrophic if it results in the explosion in oil prices that most experts in that field expect would come out of any attack against Iran. And Romney believes that, under the Constitution, he would be perfectly free to make the decision to take that down that road all by himself. Conor Friedersdorf wonders what Senator Rand Paul, who recently endorsed Romney, would have to say about this given what he himself has said about this view of Presidential war making on repeated occasions since taking office last year. The United States survived decades of containing Soviet power. America outlasted what may have been the greatest security threat in our history partly because of a policy of containment. 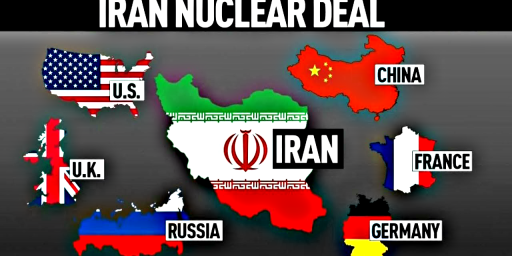 Iran is far weaker than any threat the USSR ever posed. If the U.S. could not survive a nuclear-armed Iran, a President Romney would be powerless to change that. On the other hand, back in the real world, if the U.S. has little to fear from a nuclear-armed Iran and is more than capable of deterring any threat from Iran, there is no reason to listen to anything Romney has to say on this subject. Romney obviously does not believe war is a last resort, and he clearly doesn’t believe that the Congress has anything to say about attacking Iran. According to Romney, it is something that the President could do tomorrow if he believed it necessary. The Constitution is completely irrelevant to Romney, and so is the consent of the American people expressed through its representatives. No one should have any illusions about how Romney would conduct foreign policy if he is elected. And yet you’re unlikely to hear much criticism of Romney for this brazenly unconstitutional position from Republicans, and not a word from them if he indeed becomes President and starts pushing the nation down the road to a war with the Islamic Republic. Given the domestic politics of the Iran issue, you’re not even that likely to hear many Democrats criticize a President Romney under those circumstances. The ironic thing about this, of course, is that Romney spoke these words on the same weekend that other Republicans are asserting that the President is abusing Executive Branch powers by enacting a change in immigration policy that, in the end, isn’t nearly that revolutionary. I don’t know about you, but I have fewer concerns about a few illegal immigrants than I do about a President who believes he can unilaterally take the nation to war. Even George W. Bush didn’t believe that, and the fact that Mitt Romney can talk about it so casually makes me think that my earlier evaluations of his foreign policy positions were mistaken. This is unlikely to become an issue in the election, of course. For one thing, Iran is wildly unpopular among American voters and the idea of preventing them from obtaining nuclear weapons is one that has been fairly popular in polling over the years. For another, given his own actions in Libya, the President is hardly in a position to criticize Mitt Romney on an issue like this, and he’s unlikely to want to be seen as weak on the issue of Iranian nuclear weapons (which is one reason why I find assertions from his supporters that Obama would never attack Iran to be mostly specious). Indeed, the President’s actions in Libya directly contradicted what he had said on the issue of Presidential war powers as a candidate for President. 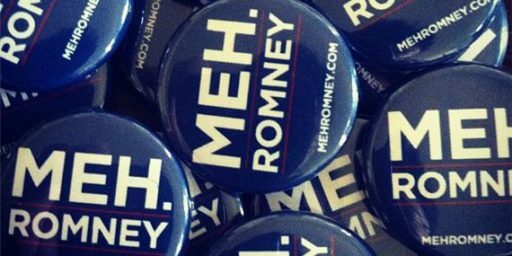 But, none of this leaves Romney off the hook. He’s essentially claimed the powers of a dictator, and someone needs to ask him why in the world he thinks an American President should ever have such power. Update: Kevin Drum argues that Congress bears some responsibility in the extent to which Presidents have expanded their authority in the area of war making, and he’s absolutely correct. As I noted last year, it’s largely Congressional acquiescence that has created this situation. In my mind, every President from Truman on has had “disturbing opinions” on Congressional war powers. Inasmuch as Congress has not declared war since 1941, our military engagements in Korea, Vietnam, Grenada, Kuwait, Bosnia, Afghanistan, Iraq, and a number of other places have not officially been “wars” – a wild stretch of logic. One can understand the reluctance of Presidents to seek an official declaration of war, since Congressional leadership authority has diminished, resulting in a good chance that a request for a declaration of war would fail. However, previous Presidents have grudingly accepted the fact that Congress should have some say (minimal) in large war operations. (Smaller operations, such as the Mayaguez rescue, are a different matter.) From that perspective, Romney’s views on an action against Iran are a step beyond what the previous dozen Presidents have asserted. Read the highlighted portion of that quote again. Seems pretty clear that Romney is talking about bombing and special ops, not a full-fledged invasion. U.S. presidents for decades have been bombing and staffing other countries without Congressional approval, even subsequent to the War Powers Act. If Romney had said he thought he could invade and occupy Iran without Congressional or U.N. authorization then perhaps there would be cause for some alarm. Speaking of which, is the War Powers Act itself Constitutional? In any event, I fail to see the need for high dudgeon mode. Larison has been all over Romney’s foreign policy and it’s not just Iran. But what do you expect – he has surrounded himself with neo-cons from the Bush administration. There is absolutely nothing in that statement from which one may conclude Romney “only” wants to bomb and engage black-ops forces, both of which are acts of war anyway. Mr. Mitt is clearly stating he, as president, will have authority to use any means necessary including invasion and will do so. Excuse me, but aren’t we already at war with Iran? Seems to me like the invasion of the American Embassy in Tehran would constitute an act of war. In the early days of this Republic, when the politicians had the cajones to do something against a threat, the Marines would have been sent in and things would have been put to right. Now all we have are a bunch of lilly livered cowards running the government and all they want to do is just enrich themselves and to hell with everyone else. So what Romney is proposing is just a strike back at what the Iranians did to us 30+ years ago. @Stan25: I love your parodies. Keep the laughs coming. Point of order…The Obama administration has already declared war on Iran!!!! They have been launching cyberattacks on the nation for the past year!!! @Stan25: Aw crap… now the Brits are going to bomb us for the terrible things we did 230+ years ago! To be fair, Obama may have pushed this particular sled partway down the slippery slope with his excellent Libyan adventure (I don’t think Congress would’ve seriously objected, but he did decide to not even bother). I also agree, Doug, that assuming an Obama re-election means no war with Iran is basically wishcasting. I think the chances of outright war with Iran are low (but higher than I’d like) whether Obama or Romney is POTUS, though I do think they’re slightly lower under Obama. Romney runs with a particularly bad FP crowd (unrepentant NeoConservatives). Thank you, Stan25, for giving us a clear demonstration of the kind of ready-fire-aim policies that have done nothing but land us in quagmire after quagmire since the end of the Second World War. Romney is only saying that he would like to do what most presidents want to do as much as possible – bypass Congress. his statements that he would do ‘the exact opposite’ of obama regarding israel are even worse. all it says to me is that he is completely unserious about foreign policy. but, i guess, who is really going to notice? I think he’s been reading the fine print at the bottom of Shelly Adelson’s check. The concerns may be premature. Over a long enough timeline Mitt’s bound to put something else on the Etch A Sketch. @Tony W: No court challenges, presidents just ignore it. I am going to bomb the USA…. maybe I will use a drone. Heck, if the US can use drones against the wishes of a sovereign nation like Pakistan, I should be able to use them against the US to attack those that I think are a danger to world peace. And the fact that a few civvies are killed in the process…oh well….just a bit of collateral damage. The USA is a danger to the world – Romney is a prime example. We could get thru the Cold War with China and Russia but now we must ignite a global war over nuclear weapons that may not exist now and may never exist in Iran. The US never negotiates, they only dictate. It is our way, or no way and then let’s bomb away. Can you say world war 3 Romney? Because that is what you will unleash on the world. Alas, this ship sailed long, long ago. Indeed, Congress admitted as much with the 1973 War Powers Act. Passed over Richard Nixon’s veto, they mandated that presidents must notify Congress as soon as possible after sending American troops to war, that presidents had to get permission to keep them at war more than 60 days (90 if the president felt really strongly about the war). That stands the Constitution on its head but, again, the bar had moved so far that Nixon vetoed that as an outrageous limitation on presidential power. Where some of us pushed back on Obama over Libya was that, at the 90 day mark, he simply declared that American warplanes shooting at targets over Libya didn’t actually constitute “hostilities” under the WPA so, well, bugger off. I don’t like the idea of all powerful president and I don’t approve of much of what Obama is doing. But that said we have a totally dysfunctional congress. Certainly a a problem. When Congress orders a President to desist and the President refuses, that is when there is no longer a check. Congress has abdicated their constitutional role in this area, and a few others, I guess. There is nothing barring them from doing so, but I might be wrong about that. I believe a large factor was the speed of modern war, especially thermonuclear weapons and the USSR competition in the Cold War, which prompted this. We must be careful who we elect President. @Dazedandconfused: I agree – it’s because congress is no longer interested in what is best for the country but what is best for the Republican tribe. @Doug Mataconis: You’re overreacting Doug. Mitt Romney has just said what every president since — what, Eisenhower? — have actually done. For better or worse, “military force” is no longer the same thing as “declaring war”. What I want to know is how our current “cold war” with Switzerland is being ignored? We deliberately and illegally destroy their businesses … many of their citizens are scared to leave the country for fear of (false) arrest by us*. Destroying another country by Economic War is not better than using bullets to do it. *See Business Insider. Not that long ago, “we” destroyed Switzerland’s oldest private bank. Now, all Swiss bank employees are scared to leave the country, lest they be arrested and deported to the US. Not just “high ranking”, BTW — even their secretaries.